In the thirtieth issue of the Bed and Breakfast Traveller, we take you to Northwest Saskatchewan, a region rich in both history and modern accomplishments and attractions. Fall is upon us and with a few really nice days still to come before winter sets in, and the garden being in, there's a yearning for a quick pre-winter "getaway". How about a historical weekend tour, complete with battlefield sites, old forts, and art museums, with friendly hosts right adjacent to a provincially designated Lakeland "Recreational Site"? Just inside the Saskatchewan / Alberta border, an hour north from Lloydminster, is an area truly worth exploring. It spreads from the border east to St. Walburg, south to Paradise Hill and north to Loon Lake. The southern portion of this region is farm and ranch country, the northern part, forest covered lakeland. It's a perfect place to spend a few days, with something different to be experienced each day. There are several B & Bs sprinkled throughout the area, that will welcome the explorer and provide some guidance in locating these attractions even though it is slightly "off season". Simply check out BB Canada's Saskatchewan website on line. In 1885 the Northwest Rebellion raged through the area as the Alberta Field Force fought to suppress rampaging Indian warriors after a spree of killing at Frog Lake in Alberta on April 2, 1885. The Cree surrounded Fort Pitt, forcing capitulation and abandonment by the North West Mounted Police. 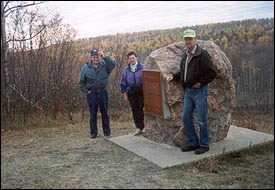 The Alberta Field Force, originating in Calgary, responded initially to the crisis by marching against the Cree just north-west of Paradise Hill at what is known as 'The Battle of Frenchman Butte". A week later the Cree, fleeing with their prisoners, were again attacked about eighty kilometers north of this battle site at Loon Lake narrows. These historical battle sites are explorable, left as they are in an undeveloped condition for over a hundred years! Recommended reference is a recently released book, 'Steele's Scouts' (Heritage House Publishing) which provides an excellent outline of the events of those turbulent days as well as giving directions to the sites at the end of each chapter. In the 1930's an exceptional, world renowned painter, Count Berthold Von Imhoff lived on a farm near St. Walburg which now has been turned into an unique art museum. Imhoff s artwork graces the exterior of his original studio, which is now a historic site worthy of a visit, south of St. Walburg. He also left his legacy through the interior decor of the Catholic Church in Paradise Hill, as well as innumerable paintings, some displayed at his home farm, others at the Fuch's Museum in Lloydminster. The quality of his "old world' style painting leaves the viewer spellbound. In one, a fly rests on an arrangement of fruit so real there's an urge to trick it off. St. Walburg is a pleasant little town of about 750 people located on Highway # 26 and is home to several Chuckwagon racing champions in recent years. The town has its own excellent museum, specializing in memorabilia of the past, located in the old Catholic Church at the south end of Main Street. "Walburg" is also home to numerous renowned artists and crafts people ranging from wildlife artists, to sculptures, to the unique Bird House Factory just south of town, off Highway # 3. There are several major events hosted in the town throughout the year including the Agricultural Fair in July, Blueberry Festival in late August, a street fair featuring displays, craft booths, and classic car "Show & Shine". Don't miss spending at least part of a day in town, play a round of golf on their new 9 hole course and experience true hospitality. On the south border of this area is Paradise Hill, located just off Highway #3 As you enter town, there's a double size replica of an ox pulling a Red River Cart. This is situated right on the historic Carlton Trail, an 1800's version of the Trans Canada Highway. In the past, hundreds of these squeaking carts trundled back and forth along it, carrying supplies and trade goods west and furs east. 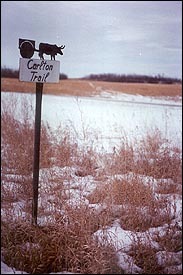 This trail is marked with small black and white signs designating where the modern municipal road crosses it. In some places the trail is still faintly visible today. The Bronson Forest Recreation Site is a tract of land specifically designated for recreational use. 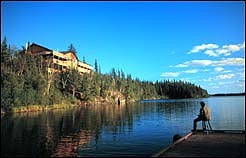 It has over a dozen lakes within its boundaries, with campgrounds located on many of them. Industrial development is prohibited and the intent is to provide a superb vacation experience for tourists to enjoy. Fishing is very good for a variety, of species such as perch, walleye, pike, whitefish and trout are stocked in some of the smaller lakes. This area abounds with trails to ride or walk, summer or winter. They are not marked so take care not to become disoriented in your exploring. 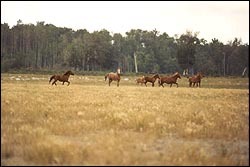 The meadows around Bronson Lake are home to a unique band of about 60 wild horses, of which a few can usually be found, grazing on the grass flats near the lake. If you have a desire to visit this area request a copy of "Circle The Northwest", a superb 70 page tourism guide available through the St. Walburg town office, phone (306) 248-3232' or write: Circle the Northwest, Box 368, St. Walburg, Sask. SOM 2GO. This guide will provide enough details on the attractions of the area to make your visit worthwhile. Visit the area and explore its' secrets--it'll cure the "Blahs'---- and I'll bet you return again! Article and photos provided By Wayne F. Brown of Lakeview B&B, Paradise Hill, SK.